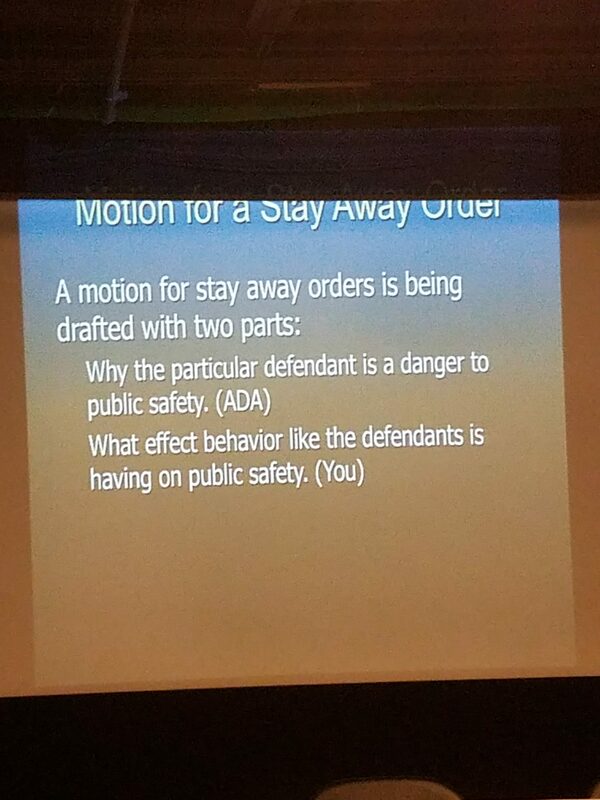 ADA Ostly is requesting that neighbors, residents/business submit a letter that he can use when requesting stay away orders for drug dealers in our neighborhood. He wants to know how we are impacted by these crimes. He will attach the letters to EACH stay away order he brings to the judges in our district. We do not have identify the dealer, that is his job. The impact on the community is what he would like from us. 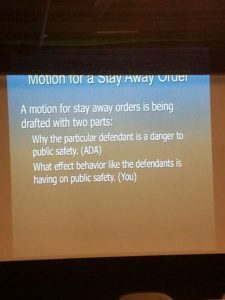 ADA Ostly would also be happy facilitate a meeting with you one on one with one of our local Judges if you would like to speak with them about the neighborhood. Just email him to setup (this would be outside of WSV). I was invited as a resident of D6 to attend the Mayors Budget Meeting on Homelesness. Supervisor Kim initiated the invitation, a number of D6 residents including Adam Mesnick of #betterSoMa and Deliboard. There were no other people attending as residents, though many in non profits may be residents. It was also the first time residents were invited. 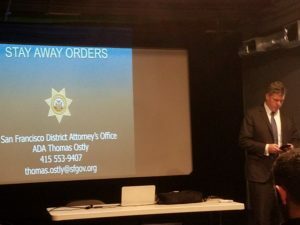 The other attendees were: City Officials – Mayor Lee, Jeff Kositsky, Supervisor Kim, Supervisor Ronen, DPH and a number of staffers from these groups; Non Profits from all over the city though 99% are located in SOMA, who were there to request budget and hand in proposals. The Mayor kicked off by acknowledging that Residents and Business are not seeing improvements on our streets. He also talked about the need to spread Navigation centers throughout the city. How we as residents see the budget numbers and wonder how we can still be walking over feces and tripping over tents. The need for mental health care and basically everything all of us have talked about for a long time. Each city Official gave a quick update, Supervisor Kim talked about the need to spread the problem as pretty much all services are located in D6 particularly Western SOMA. 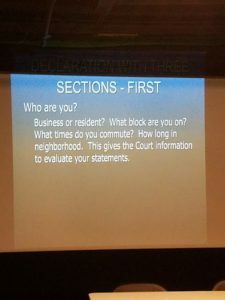 Supervisor Ronen talked about the new Navigation Center in her district (there was a meeting for D9 residents that she setup I think last week – http://hoodline.com/2017/04/mission-neighbors-pack-town-hall-over-proposed-homeless-navigation-center). It was acknowledged that D6, D9 and D10 are the only districts with Navigation Centers. Jeff Kositsky talked about the upcoming plans in his group which are detailed in the WSV meeting he attended last month. Basically we need more housing and we need to co-ordinate resources. I got to speak about the perception that the citys problems are being pushed to D6, that we concur with what the Mayor said in that we are not seeing improvements and our lives are blighted by tents, feces, needles, open drug use. I asked about the possibility of a safe injection sites – he said that though he was opposed he is open to hearing more and that Supervisor Breed has a proposal for “harm reduction sites” as they will be referred to. I also mentioned that we don’t know who to call regarding tents etc. 311 just comes and cleans around the tents, calling the police is a waste of their resources (see above). Jeff is working with the city departments on co-coordinating 311 and resources for encampments. Feel free to respond with other questions. I was really honored to attend this meeting (I say that without any irony). Its so important for residents who voted (or not) for these officials and to keep them accountable. Scoot is a network of hundreds of electric scooters that you can pick up and drop off all over San Francisco. Their Head Office is at Howard and 7th. Looking for support for parking adjustments for their electric scooters. See attached pdf for the proposal. Jane Kim’s office has reached out to ask what we in Western Soma Voice think of the plan, as Scoot as asked them to back the proposal. Our feedback will influence whether the Supervisor backs the proposal or not. Please send any feedback you have. 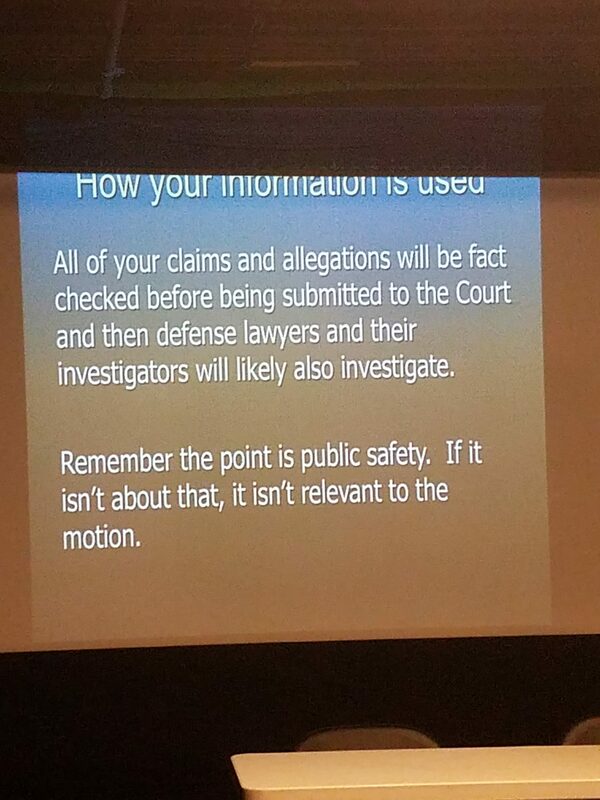 Jeff Kositsky from the Mayors office on Homeless came to talk to us, he has also shared his slides with us (though he did caution they are in draft form). Jeff talked about the history of decision made which got us to this point, e.g. closing shelters, opening respite centers, closing respite centers etc. In reality we need both and his team is intending to have both. Behind the scenes they are investing in infrastructure, which is getting a system in place which allows all of the city databases to connect to one another where it pertains to people. This way it is easier to track where a person is on a list for a bed, whether they have benefits due etc. 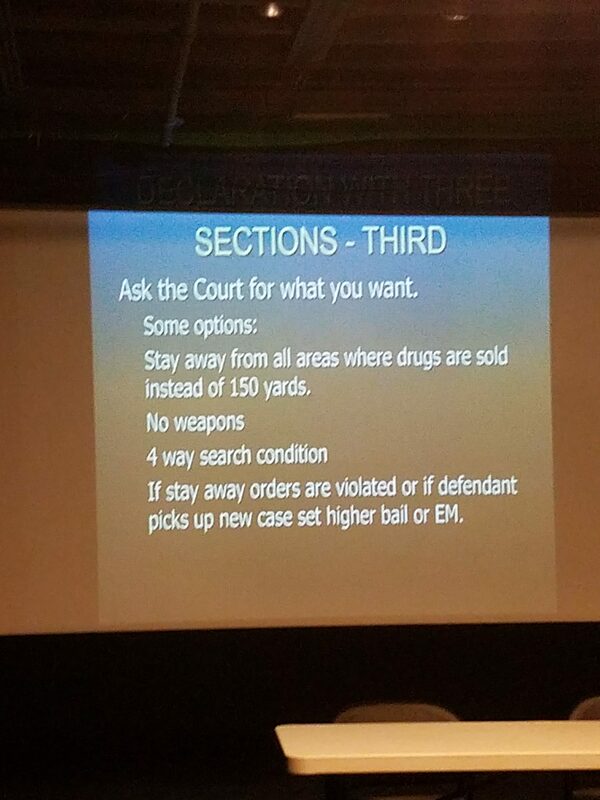 There is also a need for this as he pointed out its not a fair system if someone comes and camps in a large existing encampment and gets to skip over others to get to a Navigation Center when the Encampment resolution team comes. The Nav Centers right now are on Mission (between 15th and 16th), The Civic Center Hotel, UCSF Hospital Mission Bay, Dogpatch should open soon. Another is slated to open in the Mission. And there will be one more at Jessie and 6th street later this year. The staying time at a nav center is 30 days (Unless is the medically focused one at UCSF). 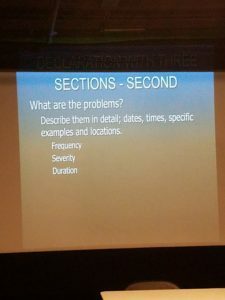 Jeff spoke openly about how neighborhoods are impacted by the tents and it is high on his list, its not just about moving on tents from street to street, that doesn’t help anyone. He also indicated that 5 or 6 years ago we didn’t see such a problem, many factors as to why there appears to more without homes? More vacant lots have been built up, an opioid epidemic (people on meth don’t sleep all day in their tents), other addictions causing people to lose homes, evictions. A questions was asked what we can do to help his Dept. The answer is Money. Though the proposal last year to add more funding was voted NO. He hopes when people see progress being made they can add a new ballot measure in the next elections. He understands that people don’t see improvements and wonder where the money is being spent. I asked what we can do about the tents when they are blocking the sidewalks, Calling 311 just goes to DPW for cleaning not tent resolution. Then its calling the police which seems like a waste of resources. Jeff said they are working on triaging the various departments. In the meantime do this for tent issues on our streets and alleys. The Folsom-Howard Streetscape Project will create better, safer streets on Howard between 3rd and 11th, and on Folsom Street between 2nd and 11th. This includes improvements to bicycle, pedestrian and transit facilities, upgrades to traffic signals, traffic circulation modifications, and changes to parking and loading. This initiative is fully funded from planning and community outreach to construction, with $26 million in local funds. * Eagle Plaza stalled due to the financier pulling out. Build Inc. is seeking new financing. * Mayor’s office has been getting lots of complaints – he has started “the fix-it team” to fix neighborhood concerns. SOMA is on the plan of places to go. Should we as group endorse a candidate? Discuss of the rash of car and property break-ins, and approaches, e.g. Place home-made signage where breakins are occurring if we can’t get the city to do it. Encourage them to install cameras? Identify where security is posted? Decide what dues are, what they are for? Start a project then raise funds? Great idea, if someone sets up a tent in the center of the plaza, how are you going to deal with that? We might be able to get revenue from renting space to a food truck, etc. We had a coffee kiosk in earlier iterations of the plan, but it takes a lot of space. It’s not currently in the plan. Does it shut down at some point? This area doesn’t have the same activity as Hayes valley, etc. That area of Hayes used to be terrible, with a freeway, unsafe, etc. it has changed a lot and this area can as well. Grew up in Palo Alto, worked from 15-21 as a cadet responder with the police. Over time because aware of the revolving door people are stuck in with prison, hospitals, etc. Switch from police to music, in Eugene Or found the Whitebird(?) clinic. Www.whitebirdclinic.org They send mental health responders to mental health crises. Instead of calling 911, you use their app to make a report ala SF311 and they will send a responder to the person in crisis, they work to establish a relationship then connect the person to services. Clients connected to them are more likely to make it through their service and treatment. They started with the tenderloin, and are expanding into SOMA, etc. Hoping to cover the Bart corridor within a year. They are open to volunteers for compassionate response, which incorporates self-defense, mental health training, etc. We work with Lava-Mae to provide outreach and such at their shower-bus. Instead of displacing people when they are in the way, we will try to pave a way for them to a service provider, in a way that is more negotiation than authoritative. We work to establish repoire, then work from a place of lifting them up rather than having pity for them. We work to link them back to their case manager, we call it meta-case management. I used your app about a month ago, I opened the app, snapped a photo, I don’t know if it worked, but 30 mins later this person is no longer there, what happens? Until recently we were just trying to respond in the Tenderloin. Usually we can respond within 5 minutes. We went from averaging 1-5 reports per day, then after a few blog posts we had 50 per day which caused us to need to revamp our software – there’s a new app coming out. How much staff do you have, what percent of calls can you respond to, what’s your average response time? We call the HOT team when we need transport. Would you then call the HOT team? I’m unclear on when I would call you. People running in street, we can get their attention. 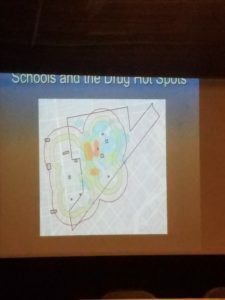 When there’s someone smoking crack near a school, we can gently remind them that there is a school here and can them move somewhere elese. The goal is to empower and humanize the homeless population, support them to get treatment and housing. Is this more specifically for people with addictions and mental health disorders? We see a lot of people who can not look after themselves. It’s difficult to say what is mental health issue and what isn’t. Mental stability often comes from financial stability. If someone is running down the street and having a psychotic break? Yep that’s our bread and butter. Yes, but we seek to get in before it gets to that point, but even then we’ve been able to intervene. We saw a fight break out the other day, a guy grabbed a girl around the neck and we were able to diffuse it without having to turn to emergency services. There’s a lot you can do by not showing up with a gun and authority. Metrics for success will be number of calls placed to you, tracking the logevity of people to services, and the efficiencies gained by the police department, and because of that, police can be working on things that are more life-threatening to the public. Soon we’ll be down to Ceasar Chavez. I challenge you to test us because once in a while, we are able to respond farther out. We both have 510 numbers, would that throw something off? What’s the cut-off point on safety etc. We don’t like to call 911, we have built relationships with officers, we call them and know they are less likely to escalate. It happens, we see things that are dangerous. We always go out in teams of 2, sometimes more. We have radio contact & support. Trainings are on Saturdays, 3-4, at our headquarters in the Tenderloin. 5 4-hr trainings gets to 20 hrs. We’re co-sponsoring, it’s set down in Mission Bay at the Mercy Housing Community Room. Co-sponsors are the South Beach Democratic club and the Homesharer’s Democratic Club. 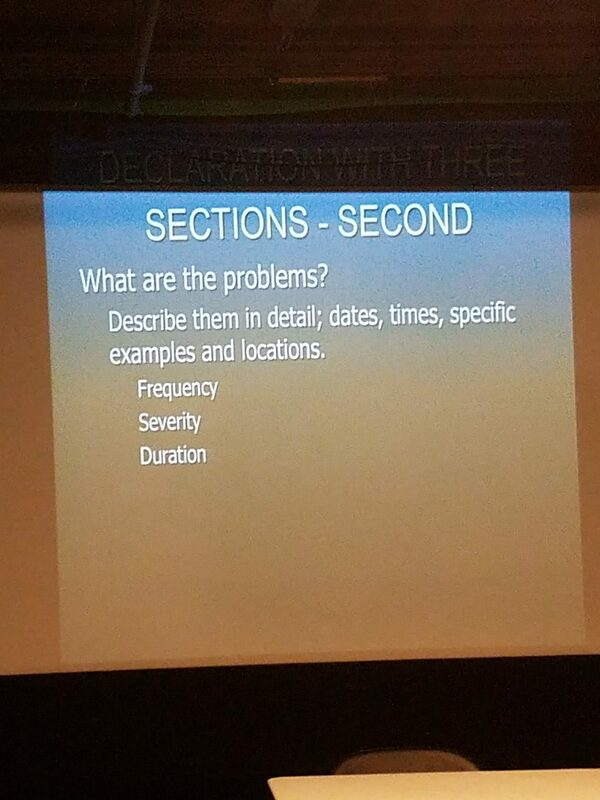 We can give 6 questions, but we need to provide them by Friday. They’ll debate the issues. We’re looking for a timekeeper. Also runners to take question cards from audience. If Jane Kim gets elected, Ed Lee will select a supervisor for the next 2 years. Presidio Knolls School is paying with Chris Foley for security on their block – how can we extend coverage more broadly. We could link these groups up. Regarding the funding of this, can we ask the city for the money? * Daryl Fong, the new Southern Station Police Captain, will introduce himself and discuss law enforcement in the area. He is joined by Officer Campos who patrols our area. Grace Street and Washburn Street have needles and unsafe areas. Hotspots should be addressed 9th & Mission, Washburn, Grace Street, etc. 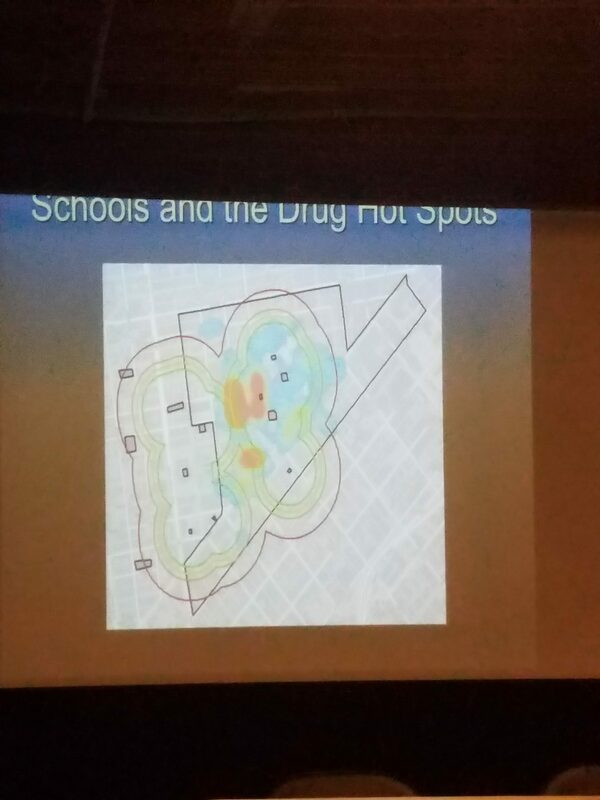 Drug enforcement strategy to monitor hotspots and homeless outreach to assess areas. Attendee statement :Not a homeless problem, there is a criminal problem. Is there such a thing as a beat cop? Cpt. Fong responds: Since redistricting between Tenderloing and Southern Station lost 14 beat officers. Taking initiative to split shifts Thursday- Sunday and as possible putting patrol officers on foot to combat increased activity. Attendee question: How do we as a group help the police? Officer Campos said most helpful is good descriptions of people enganged in activities. Including specific clothing and any identifying marks. Activate area through neighborhood use and have SF SAFE do a site assesments of improvements property owners and residents can do. Cpt. Fong stressed importance of reporting crimes. Money and resources allocated through data. 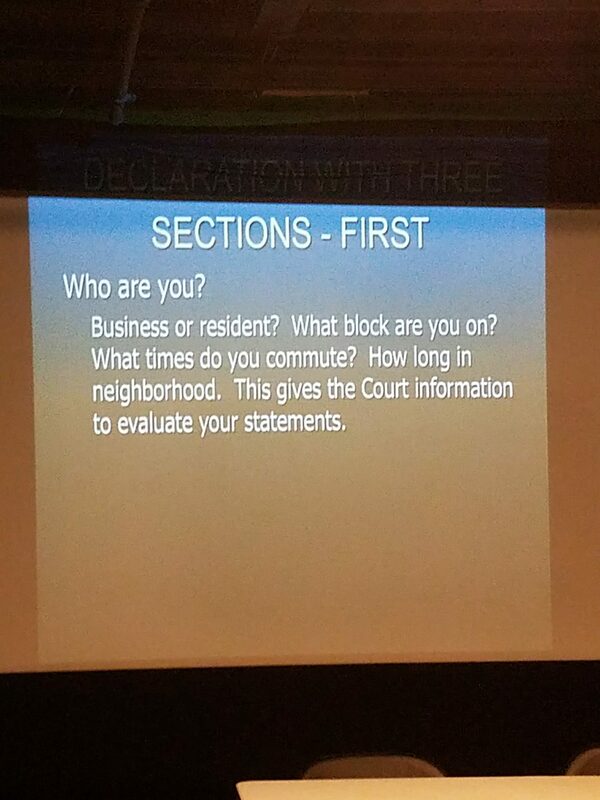 So calling 911 for active crimes, Police non-emergency and 311 for other issues (nuisance and quality of life) is very important. If there is no record of issues then city will not respond. Officer. Campos have taken notes through evening about issues they were unaware of and will take action. Outdoor disposal boxes – but where? HIV dies in the discarded syringe within a day. HEP C lasts “a little longer”. Conrad House and Public Library both possible locations for pilot program. 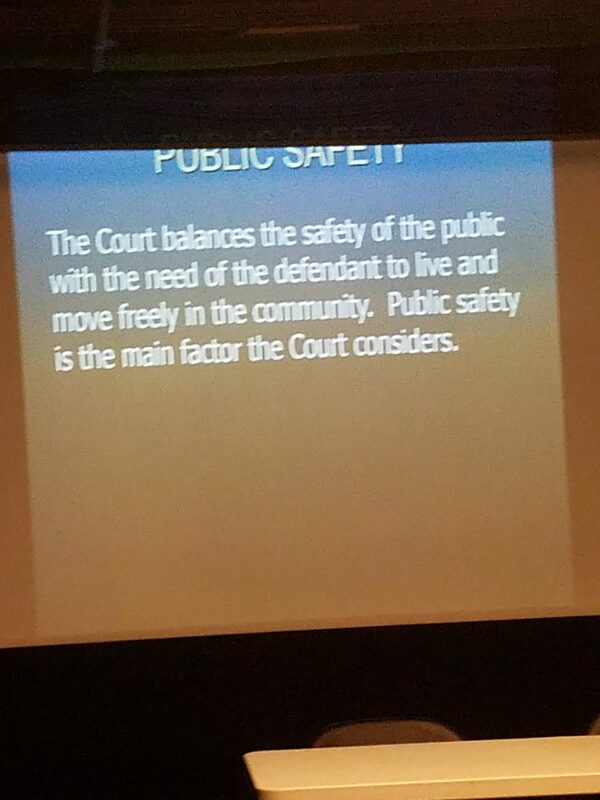 Nothing will occur without community input and can be removed if prove to be problematic. Who was the city planner? more police foot and cycle patrols at peak hours (just a note: I’d say “peak hours” for car break-ins are late night early mornings, at least in my neighborhood. I’ve never seen foot or cycle patrols other than daylight, and even sighting that is very rare). Police drive-bys in alleys – lots of places to hide in our alleys, having police drive through could help deter some crimes of opportunity. better statistics: there is no way to report a car break-in unless the car is yours, and many owners don’t bother. We need a 311 section for reporting crimes like this. 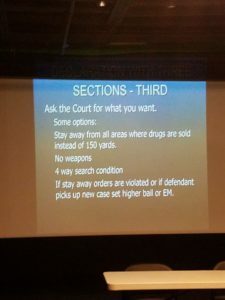 drug dealers arrested, prosecuted, moved on, and generally harassed until they give up on dealing in this neighborhood. How to address discarded needles as a public health hazard? the Gene Friend Rec Center will be running summer programs. Pit Stop Location Western Soma? discuss here or email discussion? Next meeting topic? Spokesperson – (press/blogs responses) Stephanie?? We need to check with her. 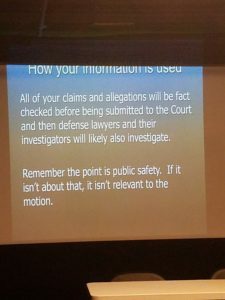 Fiona O’Shea recorded these notes from the Jan 9, 2016 meeting. We had a very large attendance – it was really great to see so many people who are ready to be available for our neighborhood. Broke into projects into tasks and assign to volunteers – as this was a first meeting for many, jumping into this seemed very quick to them.